However, this move is not without controversy. TNOYF has learned that, like Mary Landrieu and Ben Nelson in the first go-round, Kucinich’s “yes’ vote has come under less than kosher circumstances. Kucinich’s office was quick to reply to these charges. MEMORY LANE- Remember what Dennis thought of Obama's health care last year? See video below..
What did Obama do to Dennis Kucinich on Air force One, go down on him at 30,000 feet? He sure landed with a smile and a changed mind...hmmmm...why? What did he get? 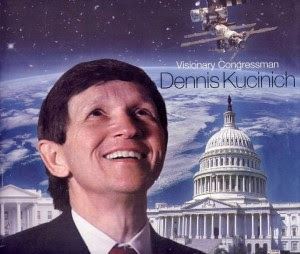 What a sellout phony Dennis Kucinich is. He's already a nut, but now he is a nut with no principles. FLASHBACK! Glenn Beck was right again. Beck on the anti-American Dennis Kucinich and his love for terrorism supporting Syria. Also, Beck lashes out at the anti-American website Moveon.org, film director Brian De Palma and left-wing attacks on U.S soldiers.